Thyroid Medication: Levothyroxine vs NDT vs T3 – Which is Best? →Thyroid Medication: Levothyroxine vs NDT vs T3 – Which is Best? This post will teach you everything you need to know about thyroid medications, how to use them correctly, how to pick the best medication for your body and other tips and tricks to help you along the way. Feel confused about which thyroid medication you should be on? or which one is the best? Many patients continue to experience symptoms such as weight gain, fatigue, hair loss and more - even though they are taking thyroid medication. This should not happen and is an indication that something is off and it may be related to which medication you are taking. What may surprise you is that the amount and dose of thyroid hormone that each person needs are highly unique and there are no "algorithms" or "equations" that will give you the answer. Is one thyroid medication better than the others for weight loss? When is the best time to take thyroid medication? How should I take my thyroid medication? Is thyroid medication available over the counter? Is it safe to take thyroid medication while pregnant? Why do I still have symptoms if I'm taking thyroid medication? Can I stop taking my thyroid medication if it's not working for me? 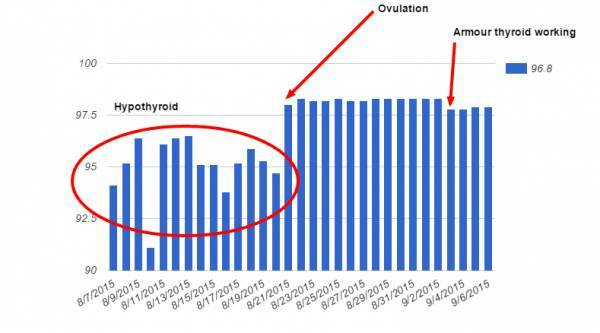 How come I'm gaining weight while taking my thyroid medication? It turns out the answer is not that simple. Wouldn't it be nice if you could plug your lab tests into a special equation and out popped the type and dose of thyroid medication that you needed? It would be nice, but that isn't reality (at least not yet)! The standard evaluation and management of your thyroid do follow a similar pattern which may seem familiar to you and that includes testing for your TSH and basing your dose of T4 medication on that lab result. This may sound nice in theory but it doesn't take into account patient genetic differences, the absorption rate of different medications, differences in thyroid conversion in each person and so on. The short version is that using a simplified algorithm to try and treat thyroid dysfunction is probably part of the reason that so many hypothyroid patients are unhappy. Instead of taking the standard approach to thyroid management it makes more sense to treat every single patient as an individual. It makes more sense to adjust dosing based on more than just lab tests and to assess factors such as peripheral thyroid conversion and genetic variability between individuals. So is there a best thyroid medication? No, because the best thyroid medication is the one that works for you and it will be different for each individual. So how do you go about finding which medication and dose you should use? It may seem like a silly thing to even discuss, right? Shouldn't it be just as easy as taking your medication and it works in your body? It sounds so simple in theory but it's actually more complex than you might think. And understanding how the medication works in your body is the first step to understanding which of the thyroid medications may work best for you. First --> The medication must be consumed. The time of day that you take your medication matters and it also matters if you take your medication on an empty stomach or with food. All of these things influence absorption. Second --> The medication must be broken down and absorbed in your intestinal tract. Certain conditions such as low stomach acid (1) (which can be caused by thyroid disease), SIBO and food intolerances can limit absorption of your medication. In addition, certain thyroid medications are easier to absorb than others because of the inactive ingredients that they contain. This is a big and very important step. Third --> The thyroid medication must make it into your bloodstream and then be converted in peripheral tissues including your liver (2) to the active thyroid hormone T3. This is another very critical step because most medications only contain the inactive thyroid hormone T4 which means that these medications (examples include Levothyroxine and Synthroid) are not active unless they are converted. Many patients (at least up to 15% (3)) may have problems with conversion and may, therefore, not activate thyroid hormone even if it is absorbed. Fourth --> Thyroid hormone must travel to your cells and land on thyroid receptors where it has both genomic and non-genomic action (4). Genomic means that it is changing your genes and non-genomic means that it influences changes in the cell directly without influencing genetic function. This process is mediated, at least in part, by another thyroid metabolite known as reverse T3. So in order for T3 to get to your cells and activate your genes, it must compete with reverse T3 for binding. Fifth --> You experience the benefits of thyroid hormone based on the AMOUNT of thyroid hormone that you are taking. Simply put you need to be taking enough thyroid hormone to ensure that all of these benefits occur. What's interesting is that you can have problems at each and every step of the way. Some patients have a difficult time converting T4 into T3 (5). In these patients taking T4 medication may not result in an improvement in their symptoms. And other patients may have problems with absorption. Their ability to convert T4 into T3 may work perfectly but if they aren't absorbing the thyroid medication in their GI tract then there won't be any thyroid hormone to convert! The main idea here is that in order for you to feel better when taking thyroid medication each of the steps listed above must be working properly. But, more important than all of these steps is that you must be taking ENOUGH thyroid hormone in order to feel better. Even if Armour thyroid is the medication for you, you need to make sure that you are on a sufficient dose. If you take a dose that is too small then you will STILL be hypothyroid and still remain symptomatic. If you have hypothyroidism then this by definition means that your body is not producing enough thyroid hormone. This deficiency in thyroid hormone manifests as certain symptoms including weight gain, mood changes, cold extremities and so on. So doesn't it make sense that if you correct this deficiency with the right amount that these symptoms will go away? It makes perfect sense and it should be your goal when seeking treatment. If you are taking thyroid hormone and you only experience SOME relief in your symptoms then the changes are high that you may be on an insufficient dose. Ok, so now that you have a solid base of information we can move on to the main differences among thyroid medications. ​Active ingredients (Thyroid hormone) - Does the thyroid medication contain the inactive thyroid hormone T4, the active thyroid hormone T3 or both? Inactive ingredients (Fillers and binders) - Are you sensitive to fillers/binders and if so will that interfere with the thyroid medication in your body? When it comes to the active ingredients (thyroid hormones) the most powerful thyroid medications will be those that contain the ACTIVE thyroid hormone T3. These medications include Cytomel, liothyronine and Natural Desiccated thyroid. Because these medications are considered to be very powerful many Doctors will shy away from their use. Instead, they may prefer to use a weaker thyroid medication that includes the inactive thyroid hormone T4. Medications in this class include Levothyroxine, Synthroid, Tirosint, etc. These medications are considered to be weaker because they are not activated in the body until they are converted into T3 (but more on this later). So, in essence, you can break down thyroid medication by how powerful it is based on whether or not it contains T3. The inactive ingredients are not quite as important as the potency of the thyroid medication but they are still important. Inactive ingredients matter because certain individuals may experience negative side effects to this component of the medication. In addition, the inactive ingredients may result in poor gastrointestinal absorption which may result in decreased thyroid hormone entering the bloodstream. So certain patients, especially "sensitive" patients, may do better on cleaner thyroid medications that contain fewer inactive ingredients or dyes. 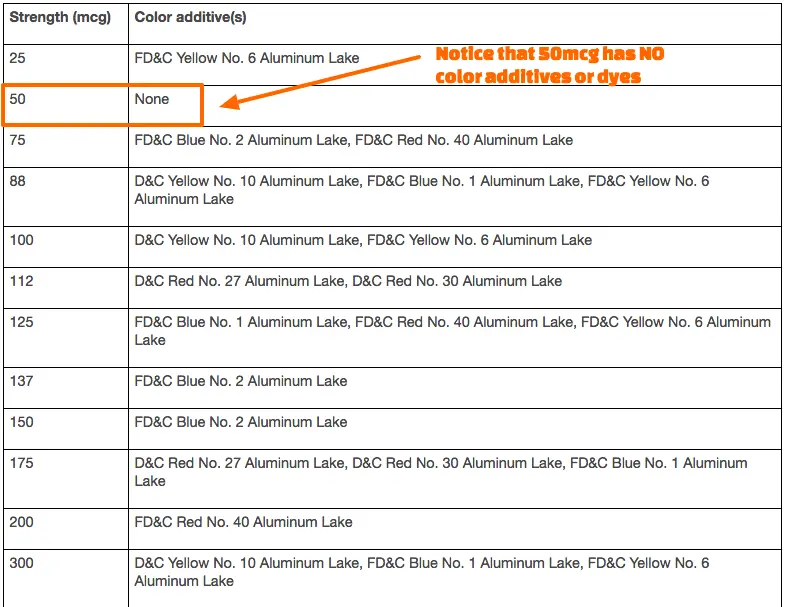 The 50mcg Levothyroxine tablet is white and, therefore, does not have any color dyes (6) added to it, unlike the other doses of Levothyroxine. Some physicians have noted that certain patients do better simply switching their dose of Levothyroxine to 50mcg increments to eliminate the extra dyes. When I am evaluating a new patient there are several factors that I use in helping me determine which medication to start with, how to dose that medication and how often to follow up. Important factors such as comprehensive lab results, personal history, and current and previous symptoms can help guide the proverbial hand in picking the right thyroid medication. But, even with these factors, you may still end up on the wrong medication or the wrong dose. In the end, sometimes the best way to determine the type of medication and dose that you need may come down to good old trial and error that is guided by both your symptoms and your lab tests. With that in mind, there are definitely some guidelines that you can use to put you on the "right track" that may give you a head start. If you've been taking Levothyroxine and your Doctor has played around with your dose for the last 5 years and you've NEVER had any improvement in your symptoms then it might be a good idea to switch medications entirely. But if you're someone who hasn't been on Levothyroxine for very long then you might want to consider other formulations of T4 such as Tirosint. Let's discuss some important factors and threads that you may want to consider when thinking about which medication to start with. These are not hard and fast rules, but they are a good place to start. There will always be anomalous individuals who simply don't follow the rules, but you can figure out if you fall into that category through the trial and error method. Includes both the active and inactive thyroid hormones T3 and T4. Patients who use NDT over T4 only medications experience more weight loss (7). When patients switch from T4 to NDT they show preference for NDT due to quality of life improvements. Contains less biologically active thyroid hormones T1 and T2. May cause a flare-up in Hashimoto's or thyroiditis due to animal tissue. Can be difficult to absorb in individuals with GI issues. Contains static doses of T3 and T4 which makes it difficult to dose in certain people. Can be difficult to obtain from many providers. Many physicians erroneously believe that dosing is unreliable (which is not true). Natural desiccated thyroid or NDT for short is the first thyroid medication we will be discussing. NDT is unique among all thyroid medications because of where it comes from and how it is formulated. Synthetic versions of T4 and T3 are created in a lab and then formulated into capsules or tablets. This should be compared to NDT which is created by crushing or desiccating the thyroid glands of animals - pigs in this case. We then take the crushed up glandular tissue, make sure it contains a set amount of T3 and T4 then formulate this as thyroid medication. This makes NDT very unique in that it contains special ingredients that other thyroid medications do not. By crushing and desiccating the thyroid gland of animals you are getting all of the thyroid hormones, enzymes and other precursors that exist in the gland itself. This formulation process allows for the inclusion of special (but less biologically active) thyroid hormones such as T1 and T2 (8). For this reason, and because some people consider NDT to be more natural than synthetic medications, NDT is often touted as the "best" thyroid medication out there. While it is true that it has special and unique properties that doesn't mean it is the best and it is not without disadvantages. The biggest disadvantage of using NDT is that the dosing of T3 and T4 is considered "static". So while it is a good thing that it contains both T3 and T4 (in addition to T1 and T2) the dose of each is "stuck" which doesn't allow for individual titration of thyroid hormone. The ratio of T4 to T3 in NDT is 38mcg of T4 to 9mcg of T3 which is roughly 4.2:1 or, put another way, each grain contains about 76% T4 and about 24% T3. This works out great for patients who do best on that ratio, but what if the ratio that you require in your body is closer to 10:1 or 90% T4 to 10% T3. The point is you don't have as much control over as many variables when using NDT. Another potential issue is that the consumption of thyroid tissue from animals may trigger an immune response and result in destruction or problems when taking this medication. This is a theoretical issue but it should still be considered if you have Hashimoto's or some other autoimmune condition. Despite NDT not being perfect a large majority of patients do indeed do well when taking this medication. Up until about 1970s NDT was the medication of choice (9) but was surpassed in usage by T4 only medications like Synthroid. For this reason, many older physicians are more comfortable using and dosing NDT compared to younger physicians which aren't as familiar with this medication. When using NDT It's always best to start low and titrate up slowly over time to prevent side effects like palpitations, insomnia, and hyperactivity. These symptoms may occur because NDT does contain the active thyroid hormone T3 which makes it more powerful than T4 medications. In general, a starting dose may be as low as 16.25mg WP-Thyroid/Nature-throid or 15mg of Armour thyroid, and up to 60-65mg/day. (*Note: WP thyroid and Nature-throid can be difficult to get in the 2018-2019 timeframe. If you are having trouble getting these medications fuffilled from your pharmacy you can check out alternatives such as NP Thyroid). The more sensitive (or older) the patient, the slower the dose should be increased and the smaller the starting dose should be. Changes to your dose can be adjusted based on your Total T3, Free T3, TSH, and Free T4 levels which will change upon taking NDT. Your goal should be to minimize the total dose of thyroid hormone that you need while still achieving symptomatic resolution and without creating supra-physiologic levels of free T3 and total T3 in the serum. For many individuals, this "optimal" dose will be around 1.5 to 3 grains or 90mg (97.5mg in the case of Nature-throid and WP thyroid) to 180mg (195mg in the case of Nature-throid and WP Thyroid). As a comparison, 1.5 grains contains 57mcg of T4 and 13.5mcg of T3. While 3 grains contains 114mcg of T4 and 27mcg of T3. Up to 15-20% of people may feel an IMMEDIATE improvement in their hypothyroid symptoms after starting NDT (any formulation). The patient above was one of those - she felt better immediately upon switching to Nature-throid and continued to notice improvement with each interval increase in dosing. You can read her entire case study here. ​For the other 80% or so of patients, it may take up to 1-4 months before you start to notice serious improvements in your symptoms. Most patients by the 4-6 week mark begin to notice changes, but the full effects may not be realized for several months. Still, some patients will notice an immediate improvement in symptoms upon starting NDT but the benefits will quickly fade - usually around the 2-week mark. If you fall into this category it doesn't mean that NDT is the wrong medication for you, instead, it might mean that you need to continue your titration. Whenever symptoms arise it's best to assess thyroid status in the body with a complete thyroid lab panel and then treat from there. Another important point to discuss is how to transition to NDT from T4 only thyroid medications such as Levothyroxine. I previously mentioned that NDT contains both T4 and T3, while Levothyroxine contains only T4 and this difference doesn't make "converting" doses black and white. Instead, it may take some time to completely transition from Levothyroxine to NDT but your motto should be to "start low" and "go slow". If you don't like math you can ignore the numbers and focus on the equivalent portion (I'm just showing my work!). If you were taking 100mcg of T4 and you wanted to switch to NDT then your dose would be somewhere between 1 grain and 2 grains of NDT (probably around 1.5 grains or 90mg). In this case, you can identify this as a potential goal when adjusting your dose or changing medication. It's not a perfect equation but it works as a starting point. It's important to state that not everyone will do well on NDT. Some patients simply do not tolerate NDT and no amount of "forcing" the medication will help. If you experience these symptoms before reaching your optimal dosing (meaning your basal body temperature is still low, your lab tests are suboptimal or your heart rate is continually low) then you may not tolerate the T3 portion of the NDT combination. For patients who experience these symptoms you can try a slower titration or swap to a different "brand" of NDT which may help, but for some people, it may be a better option to stick to T4 only medications. NDT tends to be well tolerated provided you find the right dose for your body. Normal side effects of insufficient doses tend to mimic hypothyroid symptoms while excessive doses tend to mimic the symptoms of hyperthyroidism. The presence of these symptoms should prompt further work up to determine what the issue is. One of the potential downsides of using NDT is that the dosing of T4 and T3 is considered static. This is a downside because the total amount of T4 and T3 may need to be manipulated beyond the existing T4:T3 ratio present in NDT. Some individuals may need more T3 relative to T4 and vice versa. For those individuals who take NDT but still experience hypothyroid symptoms or who still have low serum levels of T3, they may need more T3 relative to T4. Using this combination allows for the benefits of NDT (instead of switching to compounded T4 + T3 preparations) while still increasing the amount of T3. The most potent thyroid medication. May be preferable in patients with obesity, insulin resistance, and leptin resistance. Bypasses T4 to T3 conversion in peripheral tissues. May be preferable in patients with low T3 syndrome and high reverse T3. Can be dosed individually and added to existing T4 doses. May increase blood pressure and increase heart rate. More easily suppresses the TSH compared to T4 only medications. Fewer brands available (only the brand name and generic). May need to be compounded for certain individuals which may increase cost. Short half-life of about 3 hours which means you may need dosing throughout the day. T3 only thyroid medications include medications such as Liothyronine and Cytomel. These thyroid medications are unique in that they contain only the active thyroid hormone T3 otherwise known as triiodothyronine. T3 is the biologically active thyroid hormone and, therefore, the most potent of all thyroid hormones. T3 is about 3-4x more potent when compared to T4 in its ability to suppress pituitary secretion of TSH (10) (this may be helpful in dosing). This hormone (T3) is normally secreted from your thyroid gland (some studies estimate about 20% of total thyroid hormone production may be T3 (11)) in small amounts and is also created at individual tissues through thyroid conversion. The point here is that under normal conditions your body is both naturally producing and creating T3 on a daily basis. The reason this is important is that in medicine we rarely use T3 even though it seems to be a natural part of thyroid physiology. Physicians tend to give preference to T4 medications because they are felt to have fewer side effects and considered to be more stable in the serum. One potential downside to this approach is that in the setting of poor peripheral thyroid conversion (which occurs in up to 15% of patients) is that they may experience low serum T3 levels and may, therefore, struggle with weight. 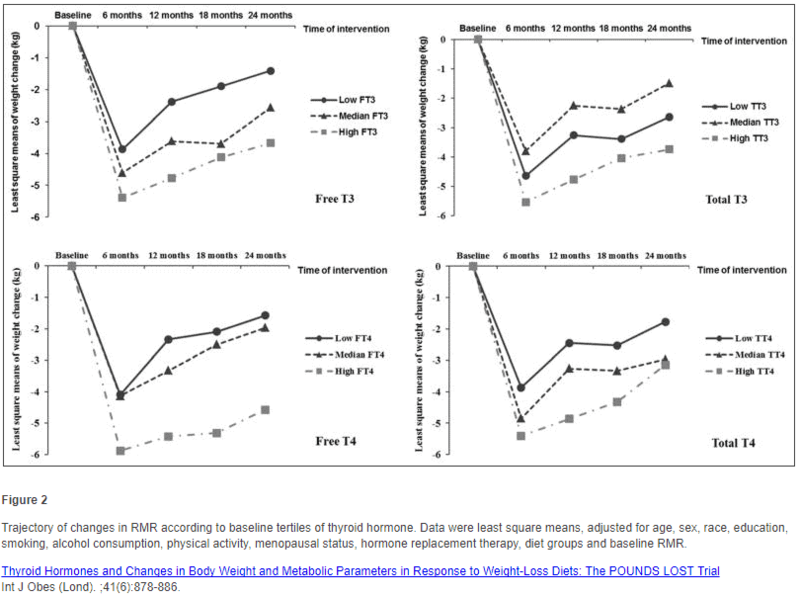 These studies show (13) that patients who have high total T3 and high free T3 lose up to twice as much weight during weight loss regimens than those with even normal and low serum T3/total T3 levels. This should foster even more attention and concern because further studies show (14) more than 20% of individuals on T4 only thyroid medications are unable to maintain free T3 and free T4 values in the "normal" reference range. Depending on your circumstances it may, therefore, make sense to add T3 to your existing dose of thyroid medication if you cannot maintain adequate serum T3/T4 levels and present with symptoms such as weight loss resistance and persistent hypothyroid symptoms. Because T3 is the active thyroid metabolite in your body it's also the strongest form of thyroid medication. This means that dosing T3 is much different than traditional T4 thyroid medications. In general, a guiding rule of thumb should be to use low doses and titrate according to your TSH, total T3, and free T3. You don't want to needlessly suppress your TSH (15), but you do want your total T3 and free T3 in the medium to high end of the reference range. Following this guide should give you the best results while minimizing any negative side effects (16). It can also be valuable to monitor two other factors while using T3 and those include your basal metabolic temperature and your resting heart rate. Both your basal body temperature and your resting heart rate can be used as a measure of metabolism and energy production in the body. T3 is known to have direct a action on cardiac myocytes (which can increase both your blood pressure and heart rate) and it may increase your body temperature through thermogenesis. You can track your basal body temperature by checking it in the morning. It may take several weeks for this to be noticed. You should also monitor your resting heart rate which can help guide your dosing and prevent excessive T3 dosing. 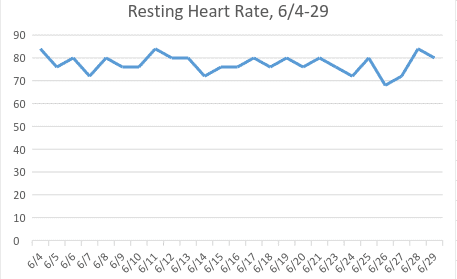 As a general rule, you don't want your resting heart rate higher than 80-90. Using thyroid serum lab markers along with your basal body temperature and resting heart rate can help guide your dosing and prevent unwanted side effects. T3 thyroid hormone has both genomic and non-genomic effects. Genomic effects take place through genetic transcription and may take several weeks to manifest. On the other hand, non-genomic effects (17) may be felt almost immediately. Genomic effects include changes such as increased hair growth, weight loss, and increased body temperature. Non-genomic effects include changes such as anxiety, rapid heart rate, heart palpitations and a change in blood pressure. Non-genomic effects may be felt almost immediately while the non-genomic effects may take time to build up. Despite this, up to 20% of patients who take T3 may feel an immediate improvement in their symptoms ranging from an increase in energy to weight loss and decreased hair loss. ​It may take up to 6-8 weeks for the effects of your current dose to kick in completely and for you to notice significant symptomatic improvement. If you don't experience symptomatic improvement within this time you can re-evaluate serum thyroid levels and determine if your dose is adequate. For those taking T3 for weight loss, you should notice an improvement in your weight in 1-2 months. For those taking T3 for insulin resistance, you should notice an improvement in glucose levels in 1-2 months. For those taking T3 with GLP-1 Agonists for Leptin resistance, you should notice weight loss in 1-2 months. Like other forms of thyroid medication T3 may not be suited for your body. Some people may be extremely sensitive to changes in serum T3 levels which may result in characteristic symptoms that don't go away unless the medication is stopped. Many of these side effects may be temporary or reduce with changes to dosing. Another potential option for people who experience symptoms of T3 dosing may be to switch to a sustained release preparation of T3. This compounded medication helps to slow down the absorption of T3 in the gastrointestinal tract which limits the rise in serum T3 associated with immediate release formulations. Sometimes slowing down the absorption is enough to completely eliminate various symptoms. This is especially true for patients who experience the non-genomic effects of T3 such as heart palpitations (18) and a rapid heart rate. Slowing down absorption may cause a more stable heart rate and reduce or completely eliminate heart palpitations. T3 is sometimes thought of (and even abused) as a traditional weight loss medication. This has to do with the ability of T3 to increase your metabolism and lead to weight loss even in individuals who don't have thyroid problems. T3 should NOT be used in this way and it is NOT a traditional weight loss medication. Abusing T3 in this way may lead to weight loss but may also have serious side effects along the way. Instead, T3 should be thought of as a thyroid medication which can indeed help certain hypothyroid patients lose weight if used thoughtfully and correctly. The use of T3 may increase your basal metabolic rate, increase the number of calories that you burn and directly burn fat cells. We've previously outlined that up to 20% of hypothyroid patients who take thyroid medication still have low serum T3 and total T3 levels. If you are a patient that fits into that category (even if you are already taking T4 thyroid medication with a normal TSH) then T3 may be a useful adjunct therapy to your existing thyroid regimen. In this case, it might also help with weight loss as well. You can read more about using T3 such as liothyronine and cytomel for weight loss here. Generally very well tolerated with few side effects. Comes in many different formulations and dosages. Long half-life in the body which means that blood levels stay "consistent". Preferred medication for patients without conversion issues. Easy to get from a doctor. Different thyroid medications (such as T3) can be added to an existing dose. Easy to monitor through lab tests such as free T4 and TSH. Contains many fillers and dyes. Doesn't work well for patients with thyroid conversion issues. Does not contain the active thyroid hormone T3. May result in inaccurate TSH values that make dosing difficult for certain patients. May take 4-8 weeks before symptoms begin to resolve. "Cleaner" T4 medications such as Tirosint may be expensive but necessary. T4 only thyroid medications include Levothyroxine, Synthroid, and Tirosint. T4 only thyroid medications are considered to be the "first line" treatment for patients with hypothyroidism. It means that your Doctor will almost always preferentially use T4 only medications if you have hypothyroidism. These medications are used frequently because they are felt to be safer, easier to dose and superior to other thyroid medications. Some of these claims are true and some may not be. It is true, for instance, that T4 only thyroid medication results in a more stable and sustained serum level of T4 due to their long half-life. It is also true that they are easier to dose than other medications and tend to have fewer side effects (but this isn't always true). Individually these are not necessarily big issues unless you are a patient that doesn't fit the "standard therapy". As we've discussed there are several documented conditions that may limit the efficacy of T4 only thyroid medications such as genetic differences (19) and personal history of caloric restriction or excessive dieting (20). In these situations, T4 only thyroid medications may fall short when compared to medications that contain T3. These problems tend to come from the experience and knowledge of your prescribing physician and have less to do with the medication itself. As a medication, T4 is a stable and high-quality thyroid medication, but like the others, it should be used only if it works best in your body and your system. Dosing and treating with T4 only thyroid medication is easier when compared to other thyroid medications. This has to do with the stability on the medication in your serum and its effects on pituitary and thus TSH secretion. Dosing with T4 is dependent upon your TSH and your free T4 levels in the serum. Like other medications, you should also be evaluating both total T3 and free T3. Checking these lab tests allow you to determine if the T4 you are taking in your medication is actively being converted to the active thyroid hormone T3. Let's consider 2 hypothetical examples to illustrate this point. This patient is taking 100cmg of Levothyroxine, has a normal TSH, normal total T3 and normal free T3. This patient has no symptoms of hypothyroidism and feels great. This patient is also on 100cmg of Levothyroxine with a normal TSH but this person also shows low serum free T3 and total T3 levels with a normal free T4. This patient also is experiencing hypothyroid symptoms such as fatigue, weight gain, cold extremities. We know simply based on these labs tests and symptoms there is an issue, but what exactly is the problem? This is a common situation and it may point to an issue with thyroid conversion. Taking T4 by mouth (Levothyroxine in this case) should be absorbed into the body and turned into free T3 and total T3 in the serum. Low serum free T3 and total T3 may be an indicator that the body is NOT actively converting T4 into T3 and may be the cause of these symptoms. In this particular patient, it may be prudent to consider the addition of T3 medications such as Liothyronine or Cytomel to help boost these levels up. If T4 works for your body then you will notice an improvement in symptoms within 1-4 months after starting the medication. If you are taking Synthroid then make sure to check out these 10 tips which will help ensure that your medication is being absorbed and utilized by your body. I've found that T4 only medications tend to take longer to take effect when compared to medications that contain T3 and this is normal. If, however, you've been on T4 only medications for more than 6 months and have not noticed a difference in your symptoms then that's a good indication it may not be the right medication for you and you should check your serum lab studies and re-evaluate your thyroid replacement therapy regimen. Medications containing T3 (which means Armour thyroid, liothyronine, and Cytomel) may result in more weight loss when compared to T4 only thyroid medications such as Synthroid and Levothyroxine. This isn't always true, however, and people can still lose weight with medications such as Synthroid, provided they are using it correctly. In theory, provided you are using a sufficient amount of thyroid medication it should not matter which medication you use. Having said that it does seem that weight loss is improved while using T3 containing medication. Some of this can be realized with small changes such as adding T3 to your existing T4 medication dose or reducing the amount of T4 you take and adding T3. This can be accomplished without causing TSH suppression. Most physicians and pharmacists recommend that you take your thyroid medication first thing in the morning and on an empty stomach. The idea here is that if you take your medication on an empty stomach then you will increase absorption by limiting competition. In theory, this works, but other studies have shown that taking your medication in the evening (21) may result in superior absorption of thyroid hormone. The proposed mechanism is secondary to a slower gastrointestinal tract which occurs naturally in the evening. You can read more about taking thyroid medication here. For best results, you will want to take your thyroid medication on an empty stomach 4 hours after a meal. You should also wait several hours after taking your thyroid medication before you start eating, drinking coffee, etc. Some supplements may also bind to and limit the absorption of thyroid medication - especially supplements that contain iron or calcium. To prevent this issue you should not take any supplements at the same time you take your thyroid medication. T3 and T4 thyroid medications are available via prescription only in the United States. T2 can be purchased as an over the counter supplement, however. In some countries, you can purchase thyroid medication over the counter, but most will require a physician prescription. You can learn more about certain supplements which are available over the counter and which may indirectly improve thyroid function here. Yes, provided you are being dosed correctly. Thyroid medication should be taken if prescribed to you during pregnancy. Adequate thyroid hormone is required for fetal brain development and is critical to normal development. During pregnancy, your thyroid should be evaluated every 6-8 weeks to ensure that you have sufficient thyroid hormone in the serum. It's also important to know that the demand for thyroid hormone increases during pregnancy (22) which means you will need a higher dose of thyroid hormone for both you and your baby. The traditional thought process for treating thyroid hormone focuses solely on the TSH as a marker of thyroid status in the body. Newer studies show that certain individuals may have problems that limit the value of the TSH as a marker of thyroid status for the entire body. Individuals who have issues with peripheral thyroid conversion, low serum T3 levels, Hashimoto's thyroiditis and so on may fall into this category. It is not normal to experience hypothyroid symptoms despite being on thyroid medication and should be a warning sign to look deeper. You can learn more about how to properly evaluate thyroid function here. It is not a good idea to stop taking your thyroid medication without physician supervision. Thyroid hormone is required for life and a complete deficiency leads to coma and potentially death. If you were diagnosed with hypothyroidism and given thyroid medication then it is because it was felt that you needed thyroid hormone. Please consult with your physician before altering your thyroid dose. In some cases, you may not be able to adequate convert T4 into T3. In these cases, it may be the case that your T4 is instead converting to an inactive metabolite known as reverse T3. If this occurs it may paradoxically slow down your metabolism and lead to weight gain. It is also possible that even though you are taking thyroid hormone that your dose is insufficient. If your body needs 100mcg of T4 but you are only taking 50mcg per day then you are at a deficient of 50mcg per day in which case you might also experience weight gain. For these reasons, it's very important that you monitor serum thyroid markers and evaluate the thyroid conversion process. Finding the right type and dose of thyroid medication for your body will help you to feel normal, lose weight and regain your energy. Finding this information should be the result of evaluating your serum lab tests, testing your body with various thyroid medications all while monitoring your symptoms. This approach will allow you to find the correct dose while limiting negative side effects which can be associated with excessive thyroid dosing. What medications have you tried? What has worked, what hasn't?